Chicago Marine Canvas is excited to begin to offer Dockside Decking, a revolutionary non-skid marine flooring product designed for rugged marine environments. Dockside Decking is a polyethylene based foam product currently available in over 10 color patterns. It’s non skid and is soft on your feet. In addition to it’s good looks, Dockside Decking won’t absorb those troublesome liquids typically found on deck such as motor oil, fish blood, red wine or beer! It is easy to clean and is stain resistant. 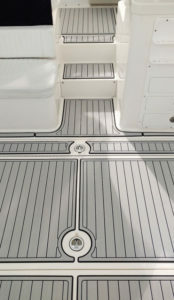 Chicago Marine Canvas will meet with you discuss what areas you would like to cover with Dockside Decking. 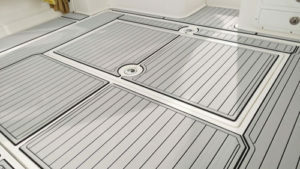 Applications can range from Aft Decks, Steps, Helm Stations, Trailers, Swim Platforms and many more! We will then take digital measurements with our 3D measuring device for a precise fit in preparation for the design to be built in our CAD (Computer-Aided Design) software. The material is cut with a CNC router bringing our design to a beautiful finished product. Design capabilities are endless, choose from a traditional teak flooring design, insert your boat name or we can work on your custom design giving you a one of a kind flooring solution.